Druridge Bay, in Northumberland, is the site of a proposed coal mine by Banks Mining. 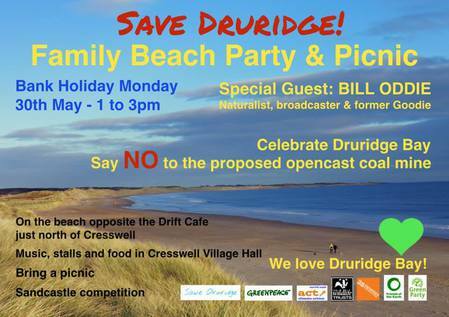 The citizens of the area, led by the Fossil Free Tyne & Wear Divestment Campaign, are saying a loud "NO" to this plan – and doing it with a Beach Party and Picnic! The event will be held on the Bank Holiday of Monday 30th of May from 1 – 3pm, and feature special guest Bill Oddie. Music, information stalls and food will be available in nearby Cresswell Village Hall, and attendees are encouraged to bring a picnic. Don't forget a bucket and spade for the sandcastle competition! Sounds like a fun event to look forward to.